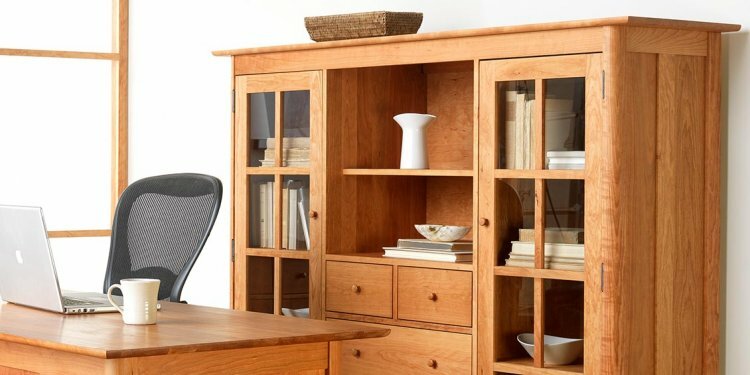 Each desk, computer armoire, filing cabinet, bookcase and conference table that we offer at DutchCrafters is among the finest solid wood office furniture you'll find anywhere. Our beautiful office furniture is made in America of solid hardwoods - taking you back to a time when authenticity was valued over commodity. While Amish craftsmanship is a testament to the past, Amish craftsmen have not turned a blind eye to the future. Quite the contrary, Amish craftsmen have developed modern design plans, and have excelled in the craftsmanship of the computer armoire and the roll top computer desk. Along with all the stunning Amish-crafted desks, chairs, bookcases, podiums, tables and cabinets on DutchCrafters, the Amish computer armoire has caught the eye of our modern audience. The contemporary design of the computer armoire, along with many space-saving qualities and an emphasis on functionality make it an ideal choice for anyone living in an apartment. Each Computer Armoire is crafted from 100% solid hardwoods, and they are handcrafted and inspected by world-renowned Amish woodworkers. Even another great choice for the contemporary shopper is the roll top computer desk! The roll top computer desk offers the utmost protection for the vital components of your computer. This includes a storage cabinet for the tower, and a roll-down top to cover and protect your screen. The roll top computer desk also offers immense organizational elements to keep you operating efficiently! DutchCrafters handcrafted, hardwood Amish office furniture accommodates to both those who value the past, and those who seek contemporary conveniences. Our collection of Amish office furniture is one of the largest ever assembled, and nearly every piece of office furniture is customizable with wood and finish options to meet the exact needs of your home.